Emilia Pinball is a free game. This means that the source code is available to be studied, modified, and distributed. Most projects look for help with testing, documentation, graphics, etc., as well. 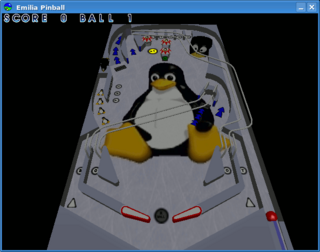 Emilia Pinball is a pinball simulator created by Henrik Enqvist. It is licensed under the GPL. An editor for making new tables, Pinedit, is also available. The latest version of the game is 0.3.1 released on December 9, 2003. It was written in the C++ programming language. A version with a zombie table exists. A version with 2 new tables and internationalization support using gettext also exists. There's also a fork with SDL2 support and the option to use PicoGL on systems that don't have decent OpenGL support. This page was last edited on 27 February 2019, at 16:14.